Cauliflower is one of the most versatile ingredient in a low carb diet. It can be used to replace meat like a cauliflower steak, shredded and used in place of high carb rice and it can also be eaten raw, baked, grilled, boiled, broiled…pfew! The possibilities are endless and I think you get the picture! This dish would make a hearty breakfast for 6 but I wouldn’t pigeon hole it as a breakfast item. It is just as delicious as a side dish at a potluck or a delicious dinner for 4. Heck, you could even shred chicken and amp up the protein even more! How about try a different cheese like mozarella, substitute the bacon for pepperoni and add some garlicky tomato sauce…..voila, Pizza Hash! Cauliflower is not only versatile but it is also packed with health benefits, its low carb and scores below 15 on the Glycemic Index. Cauliflower contains vitamin C, which helps with collagen production, and vitamin K, which may help prevent bone loss. Eating cauliflower can help boost HDL cholesterol (the good kind) levels and lower blood pressure. Cauliflower and other cruciferous vegetables (such as Broccoli, Brussel Sprouts and Bok Choy just to name a few) contain Indole-3-carbinol, a phytonutrient that has been shown to aid the liver in its detox functions. Choline, a nutrient found in cauliflower and other vegetables, helps with gastrointestinal health. Some studies have shown that Indole-3-carbinol and sulforaphane in cauliflower and other cruciferous vegetables have anti-inflammatory properties. There are only 12g net carbs per serving (4 people) and a whopping 26g of pure protein. A healthy meal that even the most picky eater will devour. Just say bacon and they will all come running to the table! In a large cast iron skillet fry bacon over medium heat until crispy. Transfer bacon to a paper towel-lined plate. 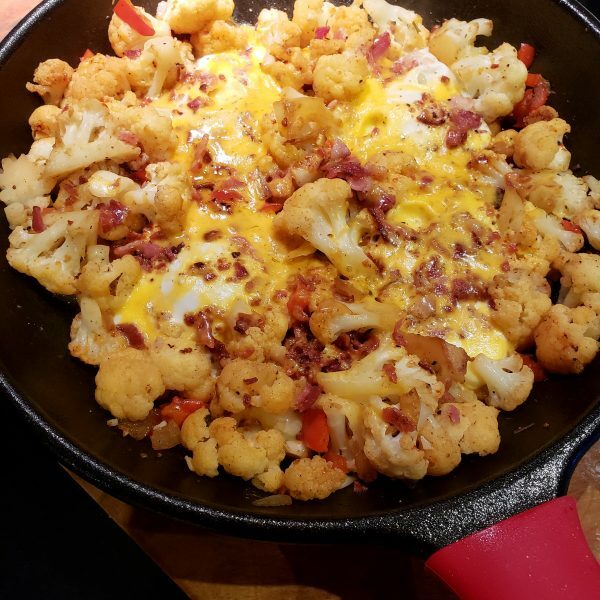 Using the bacon fat in the skillet, add onion, bell pepper, and cauliflower. Cook stirring occasionally, until the vegetables begin to soften and turn golden. Season with salt, pepper, and paprika. Add 2 tablespoons of water and cover. Cook until the cauliflower is tender and the water has evaporated, about 5 minutes. Stir in the garlic and onion powder and cook until the garlic is fragrant, about 30 seconds. Using a wooden spoon, make four holes in the hash and crack an egg into each hole and season with salt and pepper. Sprinkle cheese and cooked bacon bits over the entire skillet. Replace lid and cook until eggs are cooked to your liking, about 5 minutes for a just runny egg. Serve warm and top with hot sauce if desired.